How to increase horsepower and wheel torque without breaking bank for your BMW X6 4.4L E71. The Remus axleback Racing sport exhaust is the perfect answer. The system consists of a rear silencer with left right side exits, and 4 3.30" angled tips. ATTENTION: Not for M sport option! Remus Innovation - High quality sport exhaust systems for cars- Extensive resources dedicated to development of superior exhaust systems. 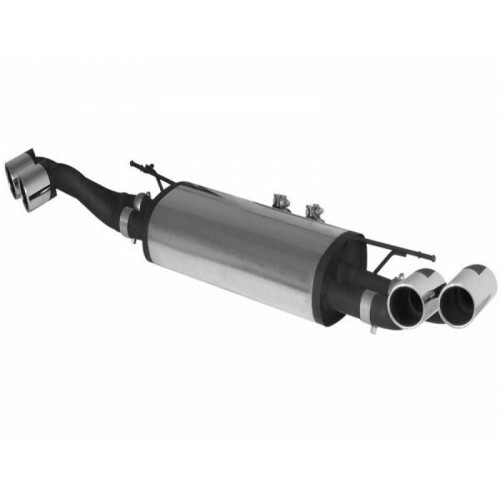 REMUS is one of the world’s largest manufacturer of aftermarket sport exhaust systems. Remus is ISO 14001, ISO 9001 ,ISO/TS 16949 and TÜV approved. Remus is OEM supplier to manufacturers such as BMW, Mercedes AMG, Porsche, Volkswagen, McLaren and tuners such as Brabus, ABT and AC-Schnitzer. This allows access to shared CAD files for fully automated quick and accurate fitment using the factory mounting points. REMUS sport exhausts feature optimized straight-through internals which significantly reduces back pressure to ensure gains in horsepower and torque. Back pressure calculations and anti-drone sound analysis is performed in one of Europe’s largest and most highly sophisticated acoustic laboratory. All REMUS sport exhausts are hand made in Austria using the highest quality materials and meet or exceed strict TÜV standards. All exhausts are constructed of 304 stainless steel with a shot blasted finish to increase resistance to fatigue failures, corrosion fatigue and stress corrosion cracking while also ensuring that they never rust. Each system is developed and designed specifically for each model to ensure correct back pressure, sound quality and fitment. Sport exhaust systems are constructed with 304 stainless steel inside and out, 416 SS or better used for tips.